Moacir Gomes Dos Santos acknowledged that he is in violation of his settlement with the city of Oakland. Christina Harbison had been watching the rusty warehouse at 2850 Poplar St. in West Oakland for nearly two months. On Jan. 30, 2018, Harbison, who is an inspector with the Alameda County District Attorney’s Office, was once again parked outside. She saw a red tractor truck pull out of the rolled doors with a large tarped metal container, so she snapped a picture. Inside the warehouse, she’d seen piles of trash, dirt, and debris. It was apparently hauled in from all over the Bay Area, broken down and sorted illegally, and then trucked back out. She decided to follow the truck as it went from West Oakland nearly 30 miles to a rural area of San Ramon. The truck driver stopped and waited outside a locked gate between two curves on Bollinger Canyon Road. The driver of a red pickup let him in, and the tractor truck disappeared into a wooded area for about 10 minutes. When it returned, its dark blue metal bin no longer had a tarp. It appeared to be empty. Later that afternoon, she returned a call from a representative of the warehouse named Jim, who had left her several messages. On the phone that day, Jim said his name was Jim Wolf and that he’d been working there for about six months assisting with business operations. The company was a construction company, not a recycling company, he said, though occasionally they would bring material back from jobs to see if it could be reused. Wolf invited Harbison to visit the warehouse the next day, where he gave her a tour. She noted piles of debris inside the warehouse. Because of neighbor complaints, Wolf said he had been working on finding a new location for the business, possibly on Davis Street in San Leandro. Before she left, Harbison asked Wolf to spell his name again and he said, “W-O-L-F,” according to a sworn declaration by Harbison, filed as part of a city of Oakland lawsuit against the warehouse owner. But the man she met wasn’t named Jim Wolf. Harbison recognized him as James Phillip Lucero, who had been convicted twice of trash and dumping-related felonies in the last five years in the Bay Area. Public records also show that Lucero, 62, has apparently benefitted handsomely from his illegal dumping operations and from polluting the air and local waterways. At one point, he owned a multimillion-dollar home in Carmel-by-the-Sea, a Bentley, and a Spanish show horse. On Jan. 23, Lucero is scheduled to be sentenced for illegally dumping construction debris on protected federal wetlands next to harbor seal breeding grounds in Newark. He could face more than three years in prison. After meeting Lucero on Jan. 30, Harbison went to Richmond to meet with Lucero’s business associate, Moacir Gomes Dos Santos, a 37-year-old Antioch resident. Originally from Brazil, Santos stands over 6 feet tall and is heavy, muscular, and intimidating. Santos explained that his construction business also rents out trash bins, but that he always properly disposes of the material as quickly as possible. Sometimes, though, landfills close early and he has to store some of the debris overnight, he told her. But he said he was looking for a property to set up a recycling center, possibly a 5-acre spot in San Leandro. The city of Oakland had sued Santos 12 days earlier, on Jan. 18. The suit alleged that when Santos started doing business out of the Poplar Street warehouse in summer 2017, he intentionally blew toxic dust into the air and the surrounding neighborhood. 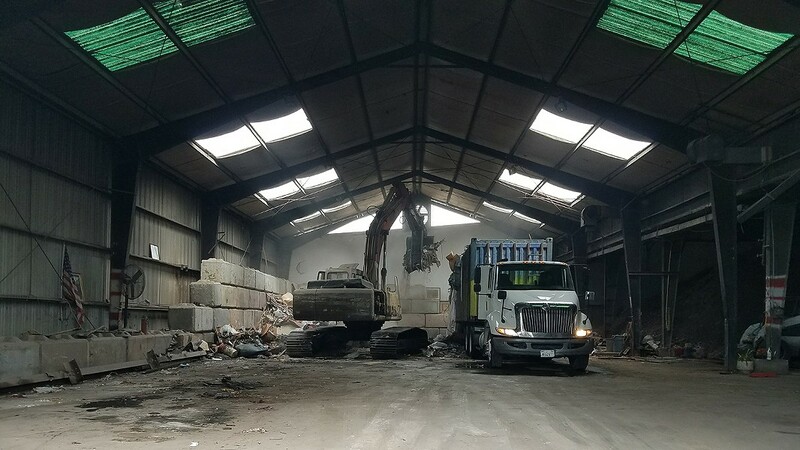 Santos, through his company, Santos Engineering, offers debris box and trash removal services to 100 cities in the Bay Area, according to his website. The business picks up debris and trash from construction sites, home renovations, or people cleaning out their garages. While Santos has argued in court documents that he just uses the Oakland warehouse to store machinery and containers, neighbors and the city attorney’s office allege that he has illegally been sorting out what can be recycled, breaking down the rest, and dumping it in various places. The dust from breaking down construction debris — including drywall, fiberglass, and old steel — could contain asbestos and lead, the city attorney’s office argues. Santos cut a hole in the roof and installed a large fan to blow dust into the neighborhood, coating streets, homes, and cars, according to the suit. Neighbors complained of respiratory problems, itchiness, and said they had to keep their doors and windows closed. Residents there have long contended with some of the worst air quality in the country, but, they say, after Santos moved in, it became worse than anything they’d ever experienced. Santos has repeatedly denied the allegations, saying that his company operates a construction company, not a trash hauling company, despite the fact that his website, SantosDumpster.com, advertises trash pickup service. His denials are often vague, contradictory, or demonstrably false. In an interview with KPIX reporter Christin Ayers shortly after the city sued him, Santos would not even say when he started operating in Oakland or whether he applied for a permit before he started doing business. “I feel like you’re being evasive,” Ayers said.